LONDON, England (CNN) -- Royal Bank of Scotland Friday reported a first-quarter loss of £857 million ($1.29 billion) as write-offs from the financial crisis increased despite better revenue. RBS chief executive Stephen Hester says conditions will remain difficult for the next two years. 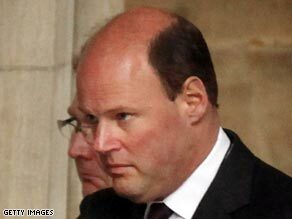 RBS chief executive Stephen Hester said the result demonstrated the challenging conditions, which the bank expected to continue. However London's FTSE 100 reacted well, the bank's shares climbing more than 10 percent soon after the announcement. The bank, of which the UK government bought a 70 percent stake after it posted a record loss for 2008 of £24.1 billion ($34.6 billion), has already announced it is cutting up to 9,000 staff under plans to save £2.5 billion ($3.7 billion) over the next three years. RBS said its first-quarter revenue rose 26 percent -- to £9.7 billion pounds ($14.6 billion) -- led by a 131 percent jump in income from its Global Banking and Markets division. Operating expenses climbed 20 percent to £4.66 billion ($7 billion). However, its bottom line was ruined by impairment losses and credit market write-downs totaling £4.9 billion ($7.4 billion). Hester said RBS was confronting "the reality of a sharp recession following a year in which the credit markets crisis caused our worst ever performance". "We have responded boldly to the crisis and its ongoing challenges. We are fundamentally changing both the shape of the business and the way that we do it. "No one should be in any doubt that this is a process that will take years not months," Hester warned. He was cool on the idea of economic green shoots appearing. "Some commentators are beginning to talk about economic recovery; we remain cautious and continue to plan and manage our businesses in the full expectation that both 2009 and 2010 will be very tough years for RBS."